Hardcover, 7.75 x 9.75 in. / 124 pgs / 54 color / 14 bw. Text by Beate Ermacora, Nina Gülicher. 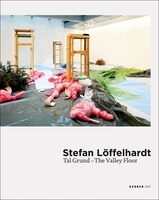 The sculptural landscapes of Düsseldorf-based artist Stefan Löffelhardt (born 1959) have been exhibited and admired widely in recent years. For his installation "Tal Grund: The Valley Floor," Löffelhardt produced a multi-perspectival work that reflects upon the relationship between people, nature and culture using ordinary recycled materials and living plants. FORMAT: Hbk, 7.75 x 9.75 in. / 124 pgs / 54 color / 14 b&w.